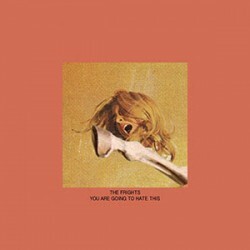 Get Ready To Love The Frights' "You Are Going To Hate This"
The Frights know exactly how you’re going to feel about their new album, released last week through Dangerbird Records. If the title You Are Going To Hate This isn’t enough of a hint, take a listen and judge for yourself. However, contradictory to the album’s title, you may fall in love with each track off their latest production. The songs will bring your inner angst to the surface, and have you jamming out to their dirty doo-wop vibe. With 50’s inspired rockabilly references, The Frights explore topics like moving out on your own, being in a confusing relationship, and growing up, all in one emotionally charged album. There’s nothing better than reflecting on your life choices through music, right? Front-man Mikey Carnevale’s vocals along with driving rhythms and reverb-drenched riffs make each song one you’re guaranteed to love, not hate. You’ll find yourself bopping along to each song’s infectious melodies and catchy tune. If the release of their album wasn’t exciting enough, The Frights just performed their special record release show, #YOUAREGOINGTOHATETHISFEST, in San Diego, CA. As San Diego natives, this performance kicked off their U.S tour alongside SWMRS, and staying true to their down-to-earth nature, the band personally invited their fans to check them out! For an exclusive preview of You Are Going To Hate This, stream it today on Alternative Press. If you’re in the mood to go back in time and listen to some 50’s inspired, surf-rock music with a twist, look no further — The Frights have got you covered! INSTANT LOVE "Living Album" Takes Shape With "Crazy Love"